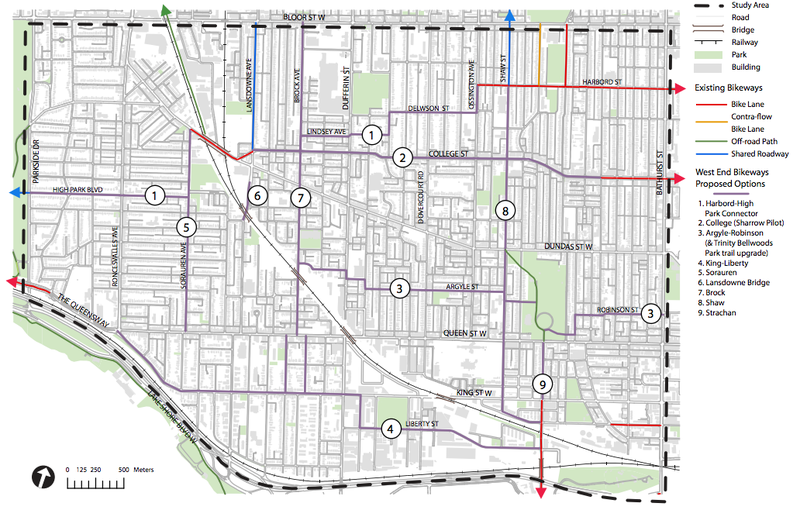 South of Harbord, the East-West options are (2) dodge car doors on College (3) cruise pleasantly up Argyle-Robinson. Argyle between Ossington and Givins is 6m wide thanks to the row of silver maples planted there around 2003. Argyle also at present has a parking lane. 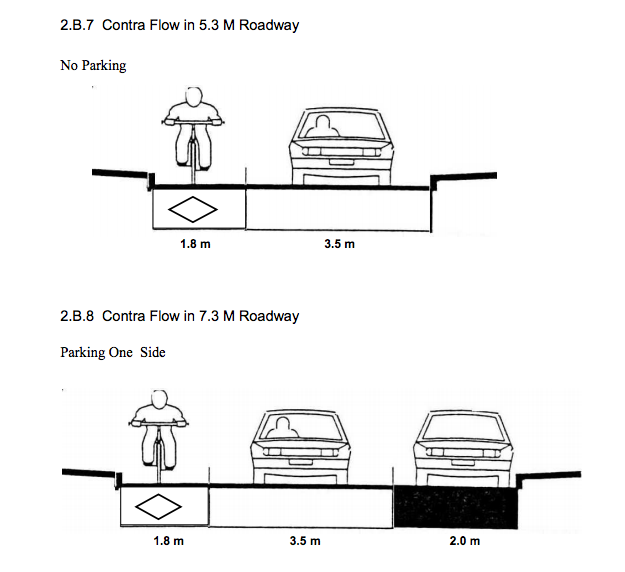 The street depicted in 2B8 is 1.3m wider than Argyle. Apparently the “absolute minimum” width for contra-flow is 1.5m (see p10). Still, 1.1m need to come from somewhere. But where!?!?!? — ah! the solution is blindingly obvious: convert Argyle into a traffic sewer for midrise condos and chain stores!!!!! The community spoke loud and clear, in the Visioning Process, the Petition, and in hundreds of communications to Ward 19 Councillor Mike Layton and City Planning (we just love you guys! 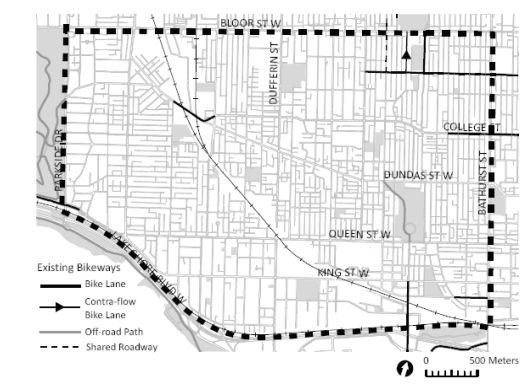 ): Keep Ossington Lowrise to preserve the cool character, stay compatible with the neighbourhood, avoid clogging our walkways and bikeways with traffic, and protect the good jobs at good wages in our light industrial buildings (click for the Community Visioning Study plan City Planning must take as input). City Planning agreed … sorta. On their first draft of an Official Plan Amendment, Ossington stays lowrise … EXCEPT a carveout for King West North Area 2 (east side of Ossington, Bruce to Argyle) … coincidentally, the part real estate speculators want for midrise (click for the first draft Official Plan Amendment from City Planning—the Area 2 carveout is principle f(ii) on the sixth-to-last page). Eh? 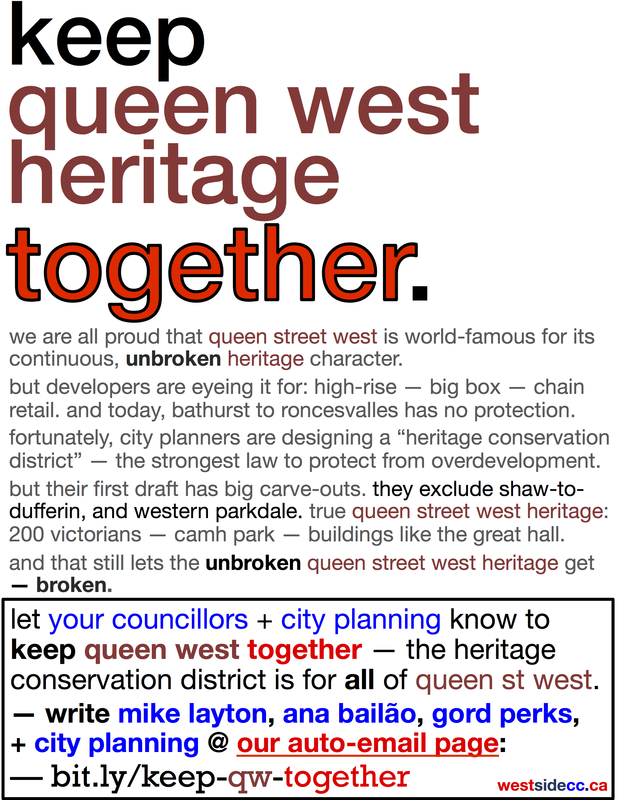 Keep Ossington Lowrise = Keep Area 2 Lowrise: the carveout for real estate speculators is ridiculous not sound planning. Make some noise. City Planning is taking input on their first draft through January 31. We’ve made it easy for you to badger express your opinion to Ward 19 Councillor Mike Layton and City Planning, either by using our pre-filled text or with your own message. 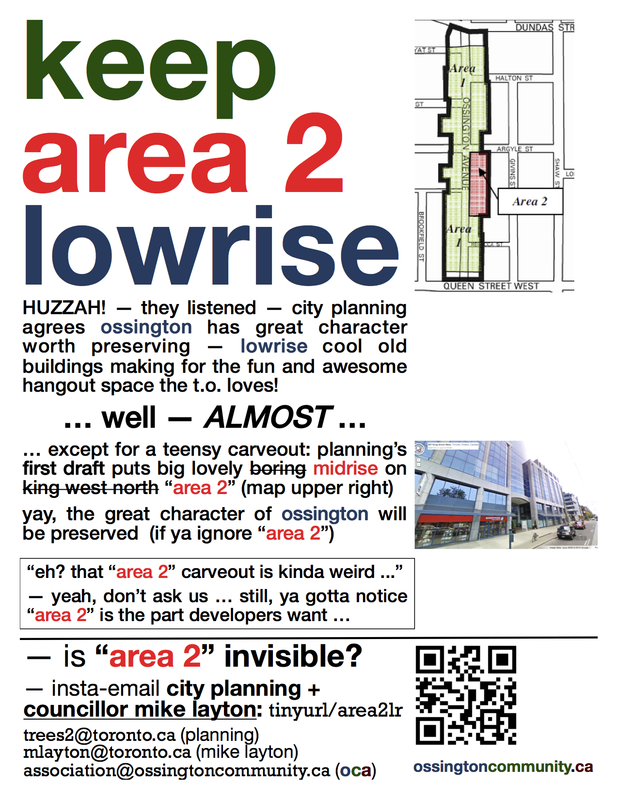 Keep Area 2 Lowrise, yo. 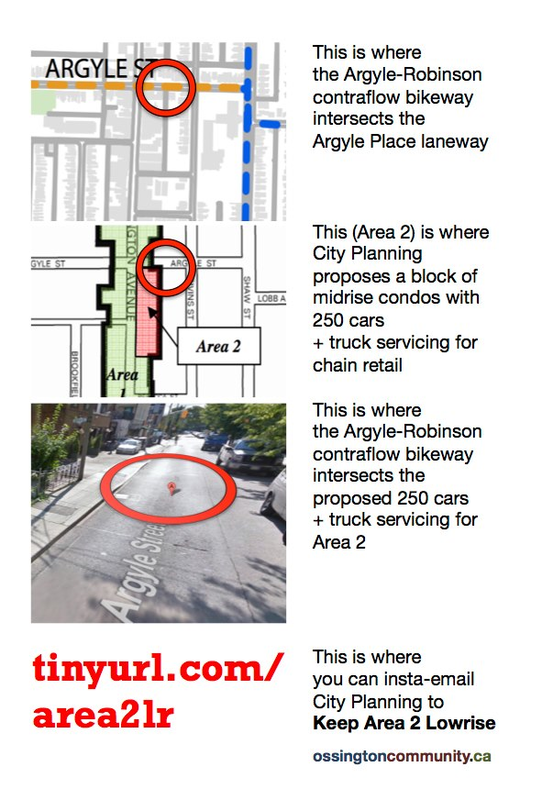 I write to oppose Planning’s draft Area 2 principles, applying to the east side of Ossington between Argyle and Bruce. The goals supporting the Area 1 principles applying to the rest of Ossington—preserving Ossington’s character and protecting its neighborhood communities—also apply to Area 2. Area 2 is at the centre of the Ossington Strip. Replacing the nice brick buildings here with a block of midrises would undermine Ossington’s character and harm 50 residences on Givins, Argyle, and Bruce. The draft propposal violates sound planning principles putting higher buildings at the perimeter and not the core of a lowrise area. Area 2 contains valuable light industrial uses that provide good jobs at good wages for many in the community, add daytime life to the streets, and are a crucial part of Ossington’s character and history. Area 2 abuts an important pedestrian and bike corridor, for kids walking to Givins-Shaw elementary school and cyclists using the Argyle-Robinson Bikeway. Midrises in Area 2 will bring 100s of cars and trucks across the path of these travelers. Preserving Ossington doesn’t mean trading good jobs at good wages for condos, doesn’t mean trading in unique old buildings for generic big new buildings that dominate over the whole neighbourhood from its very centre, and doesn’t mean undermining the safety of kids and cyclists. We can triple density on Ossington within the lowrise limits. 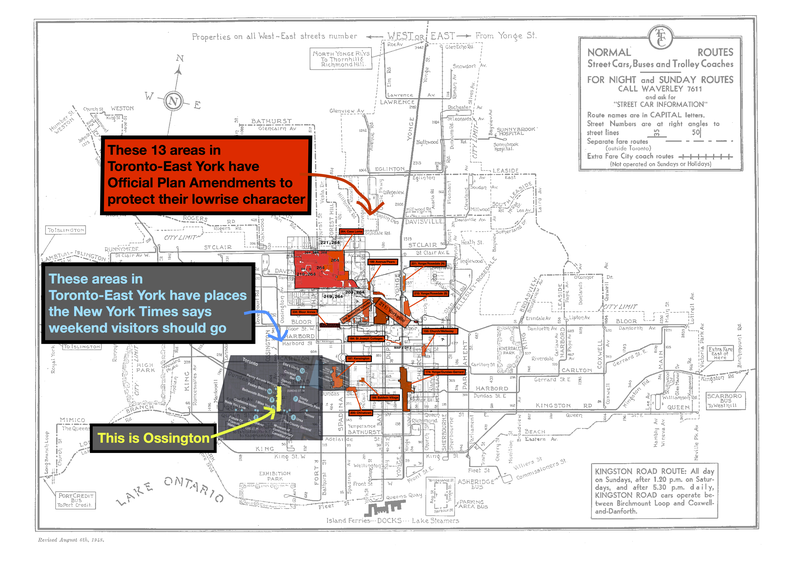 Put the community before real estate speculators: Keep Ossington Lowrise = Keep Area 2 Lowrise.